This week’s best-movies-you-may-not-have-seen is Celeste and Jesse Forever. It came out a while ago, but I caught it in my hotel room on a work trip! The movie is about the true-to-life subject about two people who are best friends, and somewhat perfect for each other and also getting a divorce because they ultimately don’t make for a happy marriage to one another. It explores a sensitive and difficult subject with a delicate touch, an awesome sense of humor, and a lot of affection for the characters in it. It’s sweet and heartbreaking, and ultimately a happy movie that leaves you with the sense that there is hope for all of us. 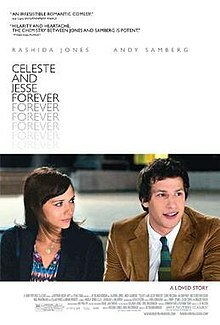 The very funny Rashida Jones and Andy Samberg star, both of whom will crack you up dozens of times in the movie. Also fantastic supporting roles for Elijah Wood, Ari Graynor, and Chris Messina. The movie also features a great cameo of a building designed by my favorite architect, Frank Gehry – The Walt Disney Concert Hall in Los Angeles. See it right away! You will not be sorry! Previous Halloween Creepiness for ya!